It is of utmost importance to implement biosecurity measures if your horse has been diagnosed with an infectious disease or fever of unknown origin. 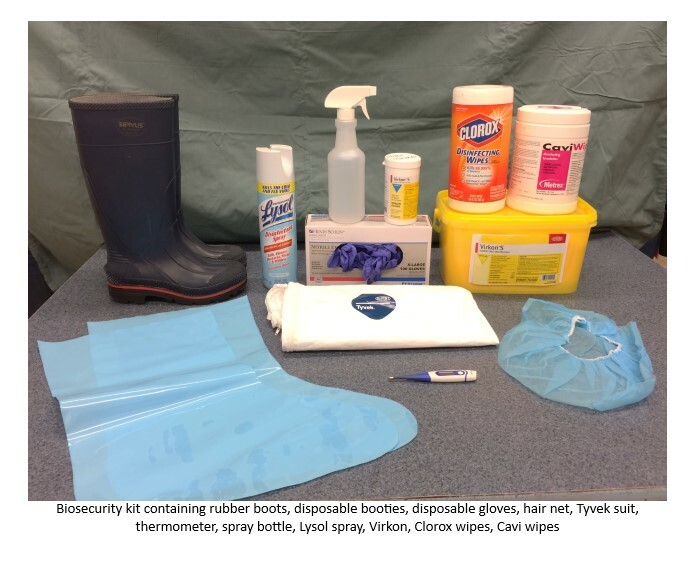 Vermont Large Animal Clinic-Equine Hospital created the following list of biosecurity recommendations for you barn to reduce risk of other horses on and off the property from becoming ill. Assign specific individuals to care for affected horses. Ideally, a caretaker should not care for both healthy and exposed/affected horses. Dispose of gloves and booties in a lidded trash receptacle after handling sick horses. Gowns/barrier clothing should be placed in a covered hamper. Wash hands with soap for a minimum of 15 seconds or use a hand sanitizer after handing sick horses. Create and mark an area near the affected horse for changing clothes, washing boots, hands, etc. Restrict access of non-essential personnel to the area of the affected horse. This includes farriers, boarders, and visitors to the farm. 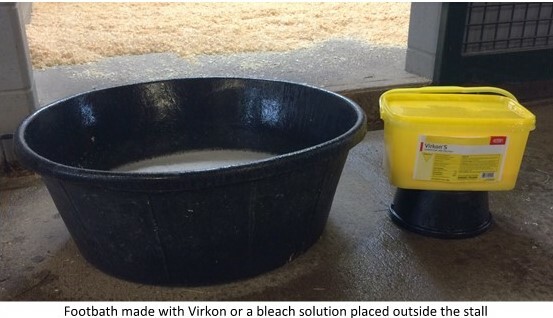 Footbaths (see below) and hand sanitizers (at least 62% ethyl alcohol) should be placed outside the stall of the affected horse. You can also place them throughout the rest of the barn for use after handling other horses. Rubber or waterproof footwear or disposable booties should be used when handling the affected horse . Use footbath after removing disposable booties or directly step into footbath if using rubber boots. Infectious diseases can spread in many different ways. Affected horses should be prevented from having direct contact with other horses and if possible, housed away from other horses to decrease transmission by aerosol droplets (sneezes/coughs). 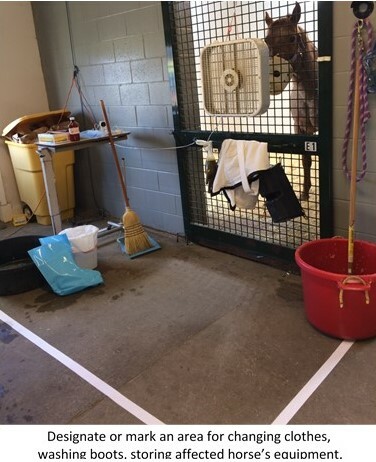 Openings between stalls should be covered with barrier material, avoid turnout, and do not use the common barn facilities (wash stall, indoor arena, cross ties). Eliminate use of communal water sources. Do not submerge hoses into water buckets when filling. Manure and soiled bedding: manure can transmit infectious diseases.Manure on wheelbarrow ties, tractor tires, etc is a potential source of the infectious agent and can be tracked throughout the property. Dispose of bedding and manure from affected horse separately. Do not spread bedding and manure from affected horse. The affected horse should have designated equipment such as: pitch fork, muck bucket, water bucket, feed bucket, thermometer, cleaning supplies, etc. DO NOT SHARE BETWEEN HORSES. Follow the resolution of the illness, all equipment of the affected horse should be thoroughly cleaned and disinfected. Ideally, following resolution of the illness, the stall should be stripped and cleaned with a dilute bleach solution before reuse. We recommend using a footbah made with Virkon or diluted bleach. Other horses in the facility should have their temperatures taken one to two times a day (using a separate, designated thermometer). Other horses in the facility should be monitored for signs of illness. 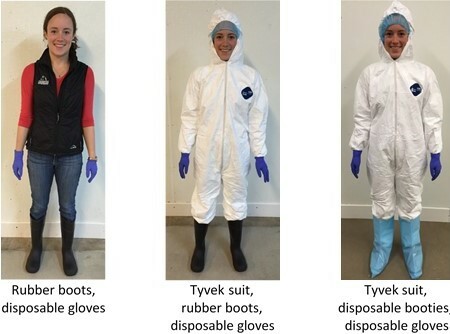 Different set of coveralls/rubber boots. Disinfectant wipes (Cavi or Clorox). Designated thermometers for affected and healthy horses.